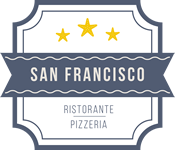 The San Francisco Restaurant stands out for its simple yet genuine cuisine, with high quality fresh products and certified provenance that are prepared daily and cooked at the moment, respecting the tradition and seasonality of the products. The fish used in our dishes is always fresh and is delivered daily to our kitchen by our trusted suppliers. Thanks to our passion and dedication, we have succeeded in distinguishing between the quality of the service offered and the genuineness of our cuisine and our pizzeria. The pizza is prepared and cooked according to the most classic recipes of the tradition, using doughs of the best flours with natural yeasts, to make our pizzas soft and extremely digestible.